Godiva and Lindt are two of the most well-known brands of luxury chocolate. Both brands have their origins in Europe, but have grown to become international companies selling chocolate around the world. Although the chocolates and other associated products produced by these brands are often very similar, each brand has its own particular recipes and styles of chocolate and a range of products for which it is known. The Godiva brand was created in 1926 in Belgium. Its founder was Joseph Draps, who named his business in honor of the legendary Lady Godiva. The company gradually grew, opening new stores in Paris in 1958 and then spreading to the US and elsewhere. The brand was sold to Campbell Soup in 1967, then in 2008, the brand was sold to a new Turkish owner, Yildiz Holding of the Ülker Group. Godiva now runs over 450 different stores around the world and the brand's products are also available through more than 10,000 other retailers. The company now earns about 500 million dollars a year. The Lindt company, which is actually named Lindt and Sprüngli AG, was formed in Switzerland in 1845. It was created by father and son David Sprüngli-Schwarz and Rudolf Sprüngli-Ammann, who owned their own store in Zurich. They set up their own chocolate factory two years later. When Rudolf retired from the business in 1892, he divided the company between his two sons. One son received on the two stores, known as Confiserie Sprüngli. The other son took on the factory and created the Chocolat Sprüngli AG company in 1899, taking on the Bern based factory of Rodolphe Lindt in the same year. The Lindt and Sprüngli company continued to grow, acquiring Hofbauer in 1994 and Cafarel and Ghirardelli in 1997 and 1998. However, Lindt closed 50 of its US stores in 2009. Godiva produces a wide range of different chocolates. It also sells a number of other types of products. Its range includes truffles, cocoa, coffee, sweets, dipped fruits and biscuits. Godiva also manufactures its own Chocolixir beverage and a wide range of different party and wedding favors and gift baskets. One of the most well-known types of products is the Gold Ballotin, which are elegant boxes of Godiva chocolates. Godiva produces special items for various holidays and it also makes ice cream, cheesecakes and liqueurs. 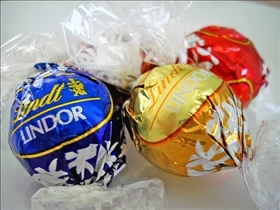 Lindt also produces a range of different chocolates. One of the most well-known is the Lindor range, which includes a variety of different flavors of hard chocolate shells filled with smooth fillings, each of which is wrapped in a different color. Other popular products are the Lindt chocolate bunnies, which are produced for Easter. They are wrapped in gold, with a small golden bell tied around their necks by a red ribbon. Lindt produces similar products including chocolate reindeer and Santa figures, for Christmas. The Lindt brand also runs a number of cafes. Although both Godiva and Lindt are considered luxury chocolate brands, the products manufactured by Godiva tend to be significantly more expensive than the Lindt products. Lindt chocolates are more expensive than less luxurious brands of chocolate, but they are still usually cheaper than Godiva chocolates. Godiva and Lindt are two European luxury chocolate brands with each having their own range of signature products. The Godiva range is generally more expensive than the Lindt range. 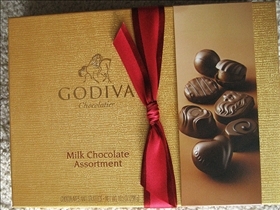 Godiva products include gift baskets, party favors and the Gold Ballotin chocolates. Lindt produces Lindor, chocolate bunnies, reindeer and Santa figures. Both brands are very popular gifts for Valentine's Day. Godiva seems having more beautiful shapes. However compared to the taste I like Lindt best as it's delicate and classic. Coach vs. Louis Vuitton: Arm Charms Par Excellence!